According to the Word, there are different levels of faith. We are told that God has given everyone a measure of faith (Romans 12:3), certainly enough for us to reach out to Him and receive our salvation. We also know that as believers we can have little faith, we read how Jesus rebuked his disciples for having this when they were filled with fear during a storm, in spite of Jesus being right there in the boat with them. 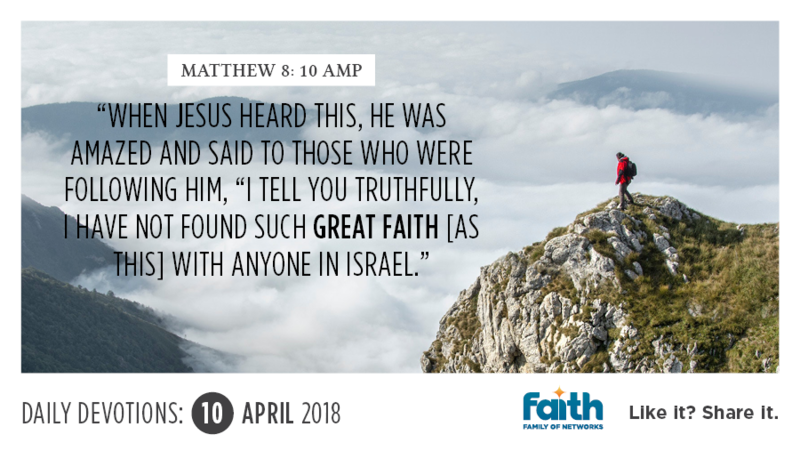 Then, we find the Bible speaking of those who have great faith, like the centurion who believed the power of God is carried and demonstrated on just His Word going forth. The wonderful news is that no matter what the measure of our faith may currently be, there is a way to increase it! Romans 10:17 says that faith comes by continuously hearing the Word of God. You see, hearing the truth of God's Word and His promises just once, or once in a while, is not enough for it to convince us, or for us to become fully persuaded that it is true for us personally. This is especially true when there is no evidence of those promises becoming our reality. When we are fully persuaded, we don't need to see with our natural eyes to believe. We are so convinced that if God's Word says it, that settles it, just like the Roman Centurion did. In Romans 4:18-21, we see this very same, fully persuaded faith demonstrated in the life of Abraham. In spite of what was humanly impossible, he chose to believe God's Word, and as a result walked in the fulfilment of His promise. If it's great, mountain moving faith you are after, then decide to turn up your level of commitment to get into God's Word every day. That way you will become fully persuaded, as that Roman centurion and Abraham were; and will discover that through faith, all things are possible.